It's too early to be talking about 2016. It is, and FHQ will not bother you with any sort of speculation about the candidates likely to emerge or how the 2016 primary season may or may not play out. That is something we can all revisit in 2015. However, FHQ is willing to entertain discussions about what the rules governing primary season during the next cycle will look like. The parties are doing this to varying degrees and it is relevant no matter what the appetite to discuss this among those who may be weary from 2012 with five months still to go before election day. The RNC has already met in full and passed resolutions/recommendations concerning the 2016 rules for the full convention to consider in August. The Democratic Rules and Bylaws Committee will probably not meet until next year to begin the discussions on 2016, but there will likely be some discussion of the next cycle at the September convention in Charlotte. Also, some members on the rules making bodies from both parties assembled at the Harvard Institute of Politics to further discuss the ways in which the Democrats and Republicans can work together to bring a but more order to the process from the formation of the primary calendar all the way through to an ideal point(s) at which a nominee should be determined. FHQ was privileged to have been invited to participate in what was more of a workshop than anything else. I've been sitting on this for a while but I wanted to share with everyone not only what I discussed in my presentation, but my impressions of what is likely on the horizon for the 2016 rules and some preliminary implications. Much of what I talked about in Cambridge is not anything that should be unfamiliar to regular readers so I won't dwell on it too much. The presidential nomination process from the states' perspective has increasingly become one of learned behavior. As it is now, there are three types of states: 1) the carve-out states; 2) states that are willing to break the rules in order to go early; and 3) states that follow the rules. What separates the second tier of states from the other two certainly involves breaking the rules, but is also greatly dependent upon the flexibility those states have in terms of being able -- much less willing -- to break the rules on timing. Florida's Presidential Preference Primary Date Selection Committee can continue to in the future hold the calendar hostage until October 1. That was the value the shifting the decision-making authority from a state legislature that adjourns in May to a different entity that can wait until October 1. The situation is similar in Arizona and Georgia (...even though the Peach state did not pull the trigger on a non-compliant primary date in 2012). In both cases, either the governor (Arizona) or secretary of state (Georgia) has the ability to set the primary date instead of a potentially divided and early-adjourning legislature. 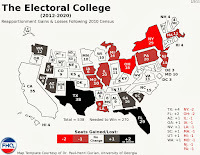 That flexibility provides these states with an advantage similar to what has allowed New Hampshire Secretary of State Bill Gardner protect the Granite state's first in the nation primary. In Michigan, the legislature meets year round, and the primary is scheduled on a date -- the fourth Tuesday in February -- on which other primary contests are held. Institutionally then, the Michigan legislature does not face the same sort of constraints as other states' legislatures, and the state has a built-in excuse/reason for maintaining a non-compliant position. In keeping with the learned behavior theme, states have not only learned to build in flexibility, but are beginning to demand more space. New Hampshire and Iowa have state laws protecting their positions at the front of the line, but each also requires a certain amount of space between their contests and others. Iowa has allowed less than eight days between its caucuses and the New Hampshire primary for two straight cycles, but the history of New Hampshire maintaining the seven days after its primary and another "similar contest" is a long yarn indeed. It popped up in the showdown between New Hampshire and Nevada in 2011 and other similar instances are littered throughout the post-reform era. This is all well and good, but there are signs that this behavior is spreading to other states. South Carolina has now for two consecutive cycles set its primary ten days before of the rogue Florida primary -- the next earliest southern state. There has now been proposed legislation in South Carolina to codify at least a seven day window between the Palmetto state primary and any other southern contest. Given the state's penchant for Saturday primaries, if that bill is ever passed, South Carolina will likely continue to be ten days before (probably) Florida. FHQ won't go so far as to suggest that this will have any huge implications in 2016 or even further down the road, but it is a trend that is worth monitoring as 2016 approaches. Of course, the space issue manifested itself in another notable way in 2012. States -- for various reasons -- took a step back from the "pile up on the earliest allowed date" approach that characterized the 2008 calendar. 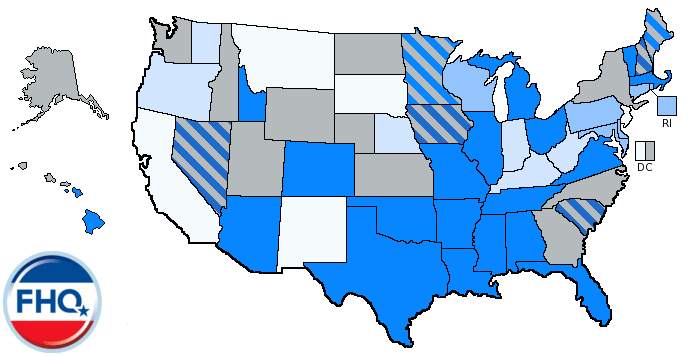 Those states that had to shift back the dates of their primaries and caucuses to comply with the 2012 delegate selection rules moved back in a fairly predictable pattern. Republican-controlled states moved back to occupy March dates while Democratic-controlled states tended to move into April or later slots. Those moves to April and later had partisan elements to them, but it was also a function of space. Those dates were typically less crowded than the first Tuesday in March ended up being. 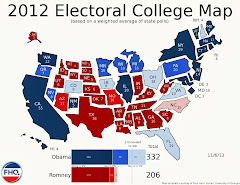 That last group of states (#3 above) still represents the overwhelming majority of states. But as Florida -- and to a lesser extent, Arizona and Michigan -- once again demonstrated, it only takes one state to overturn the apple cart, thus messing up the two parties' carefully planned February starting point. Florida going rogue again highlighted the fact that even with bipartisan coordination on the rules, that is not a sufficient barrier to states breaking the rules. As FHQ has said many times in this space, the next logical step is for the parties to devise a set of coordinate sanctions and stick to them. That allows the parties to present a united front against the states. The only problem is that there is no consensus as to what those sanctions -- coordinated or otherwise -- should be. This proved to be true of the meeting in Cambridge. There is nothing that makes this 2016 discussion more relevant now than the fact that the Republican rules will be set at the Tampa convention. When I asked one RNC member what the odds were of there being anything like the Temporary Delegate Selection Committee to examine the rules in between conventions, the odds of it were placed a 0%. Tampa is it, folks. Don't expect big changes to the Republican rules (...and by extension the Democratic Party rules). There is a fix in the works for the Florida problem. No, I don't mean cracking down on the Sunshine state propensity for jumping in line. Instead the RNC is moving to put in place a procedural fix for states that attempt in the future to repeat what Florida and Arizona did in 2012: not only jumping into non-compliance on timing, but also maintaining a winner-take-all method of delegate allocation in the proportionality window. Again, let me emphasize that the proposed fix is a procedural one as opposed to an additional penalty. The RNC obviously gives the states the ability to set their own rules, but if the states do not comply, the newly proposed rule would give the RNC the ability to seat a delegation from the state in violation that is proportional in a method the RNC chooses, not the state. This is something that the convention will have to pass in August though. It is not a reality yet. This obviously raises another related issue that came up in the Harvard meeting (...though not in this context). The Democratic rules members in attendance made the case for why "caving" and allowing full delegations from penalized states to ultimately be seated at the convention. In their interpretation there is a difference states losing clout in the delegate count in the midst of a primary race and states losing delegates at the convention. That is potentially a slippery slope that invites states that don't mind the delegate hit to schedule primaries against the rules. But, as the rationale goes, if states are willing to take the reduced impact, then more power to them. Part of what helped the Democrats bring that home in 2008 -- when it last mattered -- was the additional rule that sanctioned candidates for campaigning in rogue states. FHQ has harped on this rule in the past (and that's putting it mildly). That penalty was effective in greatly reducing the direct, during-primary-season impact on the 2008 Democratic nomination race. I have pointed to that rule as a pillar of any potential coordinated sanction regime that the parties may employ. I left the meeting at Harvard feeling less sure about the future of that rule. It was a candidate agreement more than anything else; one that will not necessarily translate to the next competitive Democratic nomination contest. The "enforcement" in 2008 was still almost entirely up to the candidates. And often these pledges are spearheaded by the earliest states -- Iowa and New Hampshire -- to protect their positions. Of course, the 2012 Democratic Party delegate selection rules (Rule 20.C.1.b) do not specify what the penalty for violating the campaigning prohibition, only that the Rules and Bylaws Committee has the ability to determine whether certain actions -- presumably beyond the laundry list of activities already specified -- constitute campaigning. It is up the the states and candidates. The RNC members in attendance thought that the new proportionality rule played a role in reducing frontloading and slowing the Republican process down. I disagreed (...and will post an edited email response to that claim in a subsequent post). 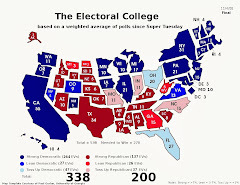 What you see in 2012, then, is what you are likely to get in 2016 in terms of delegate selection rules. There is a lot of potential drama that could mess even this calendar up. And mind you, this calendar is not rules-compliant. But with Arizona and Michigan already penciled in for the date those contests are scheduled (according to state law), the above is the likely outcome. The reason Iowa, New Hampshire and Nevada have contingency dates is based on where Nevada ends up. If the Nevada parties adopt a Tuesday caucus date, they could go just four days ahead of South Carolina -- instead of a week earlier on the preceding and customary Saturday -- and allowing a week cushion for New Hampshire. But again, this is the best case scenario for the 2016 calendar. It is two weeks better than either 2008 or 2012, but does not account for what other states might do to crash the party at the front of the line. I have feeling I'm going to be linking back to this a lot in the future. Say, 2015 or so.